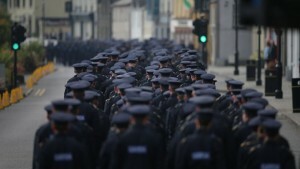 Message of sympathy from Archbishop Eamon Martin read at the Funeral Mass of slain Garda, Anthony Golden. In a personal message to the grieving family of Anthony Golden, the Primate of All Ireland, Archbishop Eamon Martin, described the slain Garda as “a true guardian of the peace”. During the State funeral at St Oliver Plunkett Church in Blackrock Co Louth, Dean Colum Curry, Vicar General of the Archdiocese of Armagh, delivered the message on the Primate’s behalf who is attending the Synod in Rome. Archbishop Martin said he was with the mourners in thought and prayer as they gathered as a “Christian family, to comfort one another, to thank God for Tony’s goodness, and to honour his life”. He said it was typical of the 36 year old father of three, “as a true guardian of the peace, to reach out so unselfishly to someone who needed his help”. Flags on public buildings flew at half mast as a mark of respect while President Michael D Higgins and the Taoiseach Enda Kenny attended the funeral. Over 4,000 Gardaí lined out along the streets of Blackrock as the funeral cortege made its way from the St Oliver’s to Garda Golden’s final resting place. In his homily, Blackrock parish priest Fr Padraig Keenan described the killing of Anthony Golden as “cold-blooded murder”. Fr Keenan highlighted that the young member of the Force was the 88th Garda to die in the line of duty. “Garda Tony’s death once again reflects how north Louth and the Cooley Peninsula have been affected by the tragic history of the Troubles on the island of Ireland, and especially the murder of Detective Garda Adrian Donohoe, three years ago at Lordship Credit Union in Bellurgan,” Fr Keenan said.